My name is Joylyn Davis and my oldest son, Ethan, has been going to speedcubing competitions for about 3 years now. We have been to over 30 competitions to date and I am here to answer any questions you may have about the community overall, competitions, and anything else that you can think of. We found competitions through YouTube videos and Ethan really wanted to go to one. When we arrived we didn’t know what to expect. I was worried that my introverted child would melt and this would be a horrible social experience. Instead what we found was a group of people who were very welcoming and supportive. We ended up staying the entire day just so that he could talk with other cubers and hang out. I saw my son talk and laugh with people he had just met. I have decided to try and support this community in whatever way I can because of all that they have given to our family. Q: My kid’s times are not that great, should we go to a competition? A: Yes. A big part of the comps is the social aspect that takes place in between their competing. That is when they learn new techniques and hear about different types of cubes and make friends. Q: My kid is really not social and super introverted. I am worried there will be way too many people and they will hate it. A: A good 90% of the other people (parents included) at that comps will also be introverted and not fond of social situations. That all changes when they come together to talk about cubes and cubing. Q: Why does my kid want to get to the competition so early? A: It may be that they are just super excited. It may also be so that they can get a spot at a table so that they can practice before they compete. As a parent you and other spectators should try to leave the table spots for the competitors. At every competition there are chairs for spectators and that is the best place for you to sit. Q: Can I drop my kid off at the competition and come back later? A: The delegate and organizer(s) are not responsible for keeping track of minors during the competition. I would say if you drove with your kid then you should stay with them. Yes, you can run out for a short time and come back. A competitor can be disqualified and asked to leave the venue for bad behavior. This can also lead to the competitor being banned from competing for a period of time. Q: Who is in charge of a competition? A: There is always at least one WCA (World Cube Association) delegate present. They make final decisions on things like +2 or if someone gets an additional solve. They are also the ones who pass on the official results to the WCA so that stats and records are official. There is also an organizer. At times the delegate and organizer is the same person. Both will have a lot of information about the event and are a great resource. If you would like to familiarize yourself with the local delegates, you can do so on the Delegates tab! Q: How can I help at a comp when I don’t know how to solve a cube? A: There are a couple of different ways that anyone can help. The first is to go up and help judge. During the first rounds there are competitors assigned to help and judge but later rounds do not have anyone assigned. This is a great way to help keep the competition running on time. There is always a judging tutorial and you can always ask someone to walk you through what you need to do. You can also help by being a runner. This is more for those who have been to a few competitions and understand the basics of what goes on. There are also fewer runners needed than judges. This involves taking unsolved cubes to the scrambling table, taking scrambled cubes to the stations, calling competitors to a station, and taking solved cubes back to the scrambling table. Q: My kid wants to be a scrambler, how do I help them? A: Scramblers are decided by the delegate before the competition begins. They are usually more experienced cubers who have been to several competitions and are known to be reliable and fast. This is something that your cuber may be asked to do at some point but I would encourage them to enjoy competing and to help with judging. Q: How fair are the scrambles and how does that work? A: Scrambles are generated randomly from a piece of software. Everyone in the same group will get the same scrambles. Also every round has different scrambles so that there are no repeat scrambles throughout the competition. The delegate does not even look at the scrambles in advance because they also often are competing as well. Have a question for a fellow cuber parent? Ask it below! 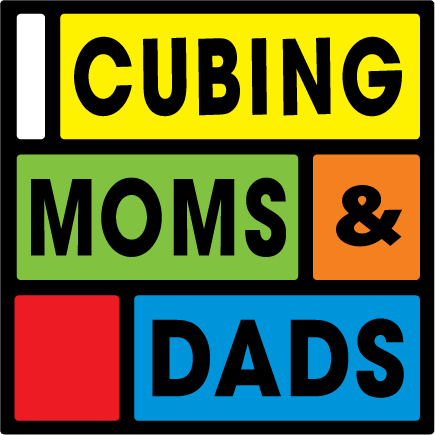 Interested in getting your hands on some awesome Cubing Mom & Dad Apparel? Head on over to the Cubing Moms & Dads Facebook page to buy some! Shirts are only $15.00 and what other to let the world know that your kid is a cuber! The page is run by Jenny Rapson, who is Drew Brads' Aunt!